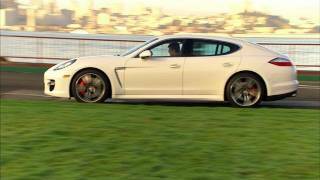 Porsche has launched the 2014 Panamera Turbo S, the fastest, most powerful and most luxurious Panamera grand touring sedan, with some extensive and top-quality range of features. 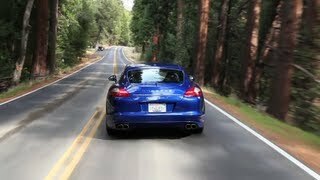 The Panamera Turbo S come in Palladium Metallic exterior color, which is available solely for the new Panamera Turbo S. The four-way rear spoiler comes painted in same color as exterior and the outstanding driving dynamics is provided by 20-inch 911 Turbo II wheels. The synthesis of exclusivity and sportiness is upheld in the interior by the two-tone leather furnishings. Highlight is the new interior package in Dark Burl Walnut. The new decor includes a hint of red, providing a slightly cooler effect, and the interior of the Panamera Turbo S is completed by the embossed Porsche crests on the front headrests. Porsche is now using two new turbochargers with larger compressors in the Panamera Turbo S model. There is a 50-hp increase in power and the torque also increases to 553 lb.-ft. The extra torque makes overtaking even easier and faster.